Columbia College will be joining colleges and universities around the nation to celebrate College Colors Day on Friday, Aug. 31. Students, faculty and staff are encouraged to display their pride of CC by sporting the college’s trademark colors, blue and silver or donning their favorite Cougar apparel. 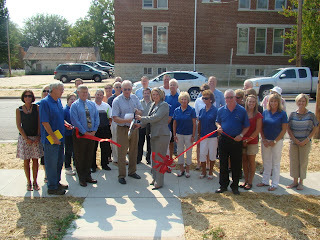 Columbia College-Jefferson City Director Becky Bocklage assisted in cutting the ribbon for a sidewalk project one of the mid-town neighborhoods in Jefferson City, Mo. The project was done as a Jefferson City Neighborhood Improvement Project with participation from the Southside Munichburg Community Improvement District for which Bocklage is the chair. Jefferson City Campus Admissions Counselor Barbara Prenger was also on hand to commemorate the ribbon cutting ceremony. Pictured: Councilman and Chair, Public Works and Planning Committee, Bob Scrivner (center) and Becky Bocklage (center) cut the ribbon for the sidewalk project.